Email is an incredibly powerful tool for fostering relationships with your customers. As a marketer, email is your best means of one-to-one communication, and an effective way to meet customers with personalized offers and helpful content. Customer loyalty is won and lost in the inbox. Customers get frustrated when content is irrelevant to their needs. But 41% of customers say they purchase from brands that send personalized emails based on past behavior. Loyalty is all about showing customers you care with emails that meet their needs. Here are 4 types of emails to help foster customer loyalty. Make a great first impression on your customers with a personalized hello. Welcome emails are your first opportunity to introduce your brand to new subscribers. Plus, welcome emails often see huge engagement: the average open rate of a welcome email is 50%. Wow. Meditation app 10% Happier takes personalization seriously in its welcome email. It pairs users with their own meditation coach — not a bot, but a real person. This approach helps ease new users into meditation while introducing an account executive in the process. Yes, abandoned cart emails are about finishing a sale. They are an incredibly effective way to recover an otherwise lost purchase. Plus, nearly half of abandoned cart emails are opened, and one-third of clicked emails lead to a sale, according to SaleCycle. 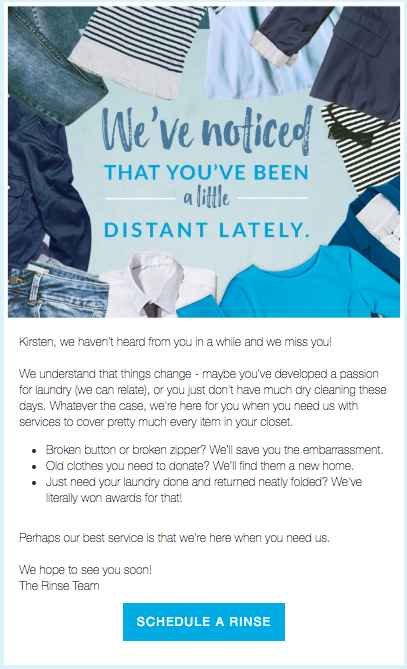 Whether a customer abandons because they lose interest or they simply forgot, abandoned cart emails are an opening to help a customer along the buyer’s journey. 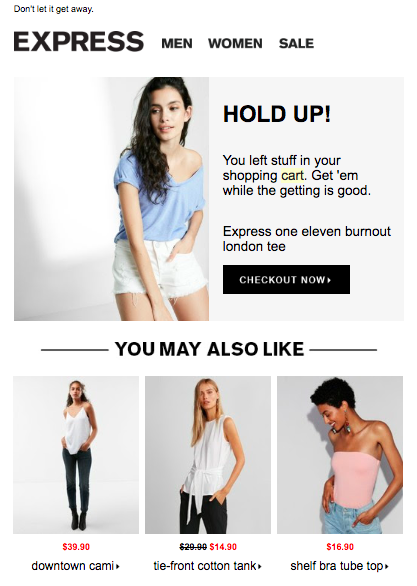 Express takes cart abandonment emails one step further. Instead of just reminding customers about an item left behind, the retail brand suggests new items that might be of interest. It’s a way to both upsell and empathize with customers. Everyone likes to feel special on their birthday. In the inbox, birthday well-wishes pay off: birthday emails generate 342% more revenue than other promotional emails. Show customers you care with a birthday email paired with a can’t-resist coupon or small gift. This not only fosters brand affinity, but brings them into stores or gets them browsing. 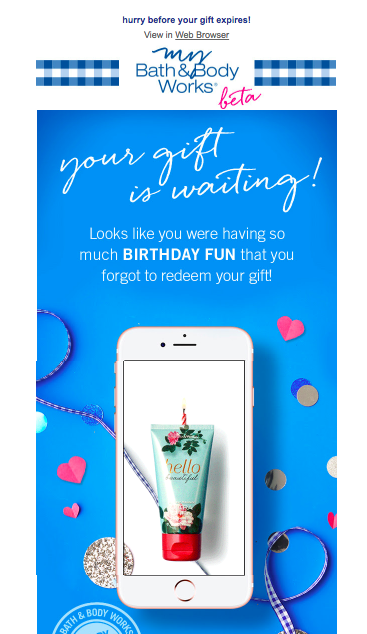 Bath & Body Works offers subscribers a free travel size body care item, which can be redeemed around a subscribers birthday by using a membership app. The result is twofold: subscribers visit a retail location and download an app, which unlocks a new channel for one-to-one communication with push notifications. Too busy with birthday fun to head to the store? No problem. Bath & Body Works knows how effective this offer is, so the brand reminds users to redeem for months. About one quarter of a marketing email database decays each year. Email Validation can help clean a list of toxic emails, but re-engaging dormant subscribers with effective win-back campaigns is vital. Plus, using Email Activity Metrics to target users who were recently active in their inbox can be especially effective. Re-engagement or win-back campaigns are an opportunity to empathize with your subscribers, educate them and — hopefully — convert. Rather than send an offer, on-demand laundry service Rinse reminds users that it offers more than simply wash-and-fold options. For occasional users or those who are disengaged, this overview might be enough to convince them to give Rinse a try for another service. Email is the core of a strong marketing program and key to any customer loyalty strategy. And strong, complete and correct customer data makes it possible. That’s where pairing first and third-party data comes in. Crafting unique recommendations requires that you know their demographic, purchase intent and lifestyle information, as well as contextualize customer behavior. These powerful insights can help marketers craft personalized content that empathizes with customers. That’s how loyalty is fostered.